The Gourmet Goodness Kosher Fruit Basket is a gift of nature's finest treats! Arriving in a beautiful natural woven handled basket are the following exceptional fruits. This lovely collection of kosher fruits is a wonderful way to send your sweetest sentiments across the miles. 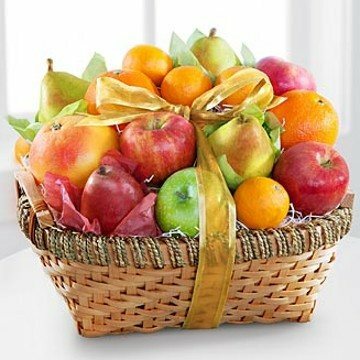 This gift basket includes the following: 3 Braeburn Apples, 1 Granny Smith Apple, 3 D'Anjou Pears, 1 Red Pear, 5-6 Mandarin Oranges, 2 Navel Oranges, and 1 Grapefruit.